Cast: Tim Allen, Martin Short, Elizabeth Mitchell, Judge Reinhold, Wendy Crewson, Alan Arkin, Ann-Margret. Story: Jack Frost usurps Santa. I had pretty low expectations for The Santa Clause 3. Not low enough, as it turned out. This is one big fat Christmas turkey, with extra giblets. Tim Allen stars in this, the most inexplicable of sequels, as a father who inherited the right to be Santa Claus. 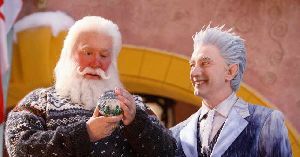 Short of ideas as they must be, surely they could have done better than this tripe about Jack Frost (Martin Short) stealing the Clausness from him. Santa's in-laws (Ann-Margret and Alan Arkin) are invited up for the holidays, who don't know the Santa secret (cue hilarity) and Tim Allen once again has to learn to spend more time with his kids instead of his job. For pity's sake, I've seen better scripts on Rentaghost. It's only small kids who can hope to gain any kind of amusement from this carbuncle, which is a strange target audience, as very few of them will have seen either of the first two movies. At least Alan Arkin (from Catch 22) is watchable, but just about every other ingredient is completely hopeless. The special effects are at a Basil Brush level and the reindeer - oh my god, the reindeer - are so shoddy that it's a while before you realise they're actually supposed to represent proper living creatures. The Santa Clause 3: The Escape Clause is total dross. With kids (and me) being treated to a seemingly endless stream of quality animations, there's no need for you to waste your money on this canker. Avoid it like you'd avoid your drunken uncle dressed as Randy the friendly elf. To enjoy this film you should be: a huge fan of Tim Allen. Or very easily pleased. The Santa Clause 3 was released in the UK on 24th November.